The Master’s Table will soon celebrate 10 years. How many websites from 25 years ago are still around today? That was 1993, there was barely in internet 25 years ago. Browsers like Netscape Navigator have come and gone since then and some early web successes, like Napster and MySpace, soared in popularity and faded away slowly. Whatever happened to AOL? Bible Gateway is celebrating 25 years and inviting all of us to celebrate with them. Click here to read more at the Bible Gateway blog. The Master’s Table is pleased to partner with Bible Gateway as we share Good News. 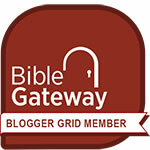 I personally use Bible Gateway to study and prepare sermons, not just for blog posts. You will find them listed in “Useful Resources” on the right-hand sidebar and a link for the Bible Gateway Blogger Grid. This entry was posted in blogging, Read and Share and tagged 25 years, Bible Gateway, Bible Gateway Blogger Grid, Internet. Bookmark the permalink.